Quad Cities Brass Band camp is a place for local brass players between 7th and 12th grade to come together and play music ranging from traditional to jazz to well known movie soundtracks. We meet for one week from 9:00-11:30 and perform on Friday at 5:30. QC Brass Band Camp is directed by Joe Brown. Joe is the Director of bands at Glenview Middle School in East Moline, Illinois. 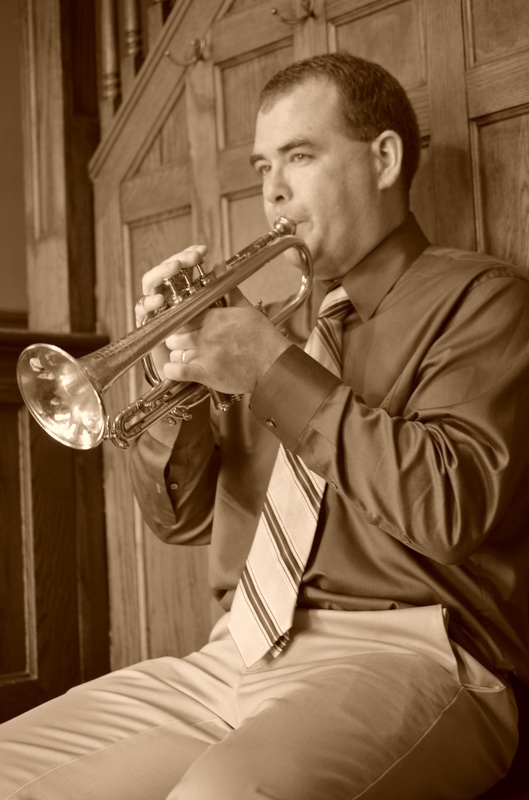 Joseph is the principal trumpet for the Quad City Wind Ensemble, a member of the Big River Brass Band, a part of a brass quintet, and a teacher for approximately 20 students per year. Joe spent 2008-2017 as the director of music at First Evangelical Free Church in Moline where he directed the Third Sunday Orchestra, The First Free Choir and several praise bands.He is also the founder of the Quad City Brass Band Camp. He has studied under many instructors including Jim Weir, David Macabee, Dr. Lambrecht, Dr. Ewold (University of Illinois) and Edgar Crocket. He has played trumpet for the past 30 years. In 2016 Joe was the guest soloist for Edison Junior High School and Washington Junior high school in Rock Island where he played Rafael Mendez's version of La Virgen De la Macarena. Joe is often called upon as a high brass specialist for junior high and high school rehearsathons. Joe's students have achieved much success. They range from 6th grade through high school. The students are top chairs in their respective bands, members of the Quad City Youth Symphony, The Quad City Philharmonic, The Junior Bix Beiderbeck Band, in addition to their school commitments. Students have competed and won the Charles B. DCamp Young Performers’ Solo Competition.